An exciting vacation to Florida cannot be enjoyed more than when it is accompanied with a dolphin encounter. Now at Panama City Beach you and your family can enjoy a Dolphin Encounter. Here you can enjoy large hugs and kisses from these adorable dolphins as they entertain you and your family. Both family and friends of all ages can gather around to enjoy this dolphin encounter. Here, friendly dolphins will reach out to you and your loved ones with big wet kisses and loving hugs. In addition, these adorable marine creatures will show off their talents and silly behaviors. Dolphins are known for being friendly and intelligent, which can be shown with their incredible tricks. One of their tricks include hand targeting where they will touch their noses to targets, the target are mostly comprised of your hands. Also, dolphins are known for loving to tease other water life, which makes for humorous scenes when the energetic dolphins begin to tease each other. While enjoying this experience, you and your loved ones can become educated on dolphins by a team of marine mammals specialists. They will be providing any and all information they can about these happy creatures. Because of this, the experience can be both enjoyable and educational. 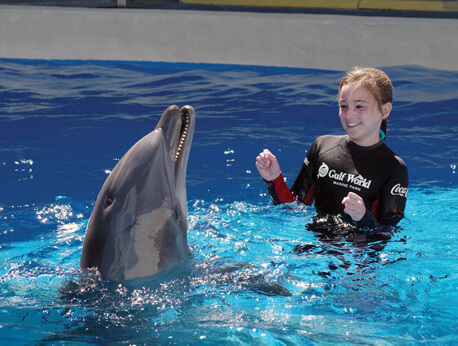 In addition, you will actually be able to swim with the dolphins after a short and informational class. You will then be able to pet, play, and swim with the dolphins. Swimming around with the fun creatures makes for great memories and wonderful photos. This is truly an event that should not be missed. Following this swim, you will be able to enjoy the Sea Lion Show, the Friends and Furry show, and then the 2016 Summer Games shows. Each activity ensues great enjoyment and learning experiences. In addition, these shows will provide a taste of the variety of animal cultures. In all, when visiting Florida, you should make sure to book your time with the Dolphin Encounter. It is a great experience that caters to all ages. The memories will last a lifetime. For safety reasons pregnant women can't participate in any of our programs.